Should recreational marijuana be legalized in Pennsylvania? For the vast majority of those in attendance at Penn State's Alumni Hall on Tuesday night for Lt. Gov. John Fetterman's listening tour stop, the answer was a resounding "yes." 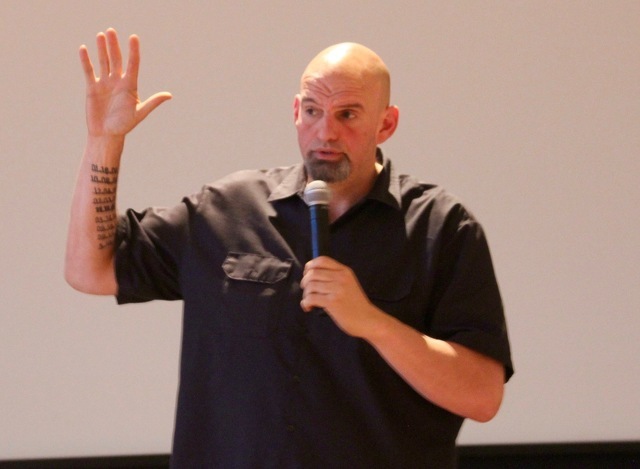 Centre County marked the 41st session on Fetterman's tour, which launched in February and will visit all 67 Pennsylvania counties for residents to offer their opinions on the possible legalization of "retail," or recreational marijuana for adults. Fetterman has in the past made no secret of his support for legalization, but as with every other stop on the tour, he did not offer his own opinion, only encouraged those in attendance to share theirs. "What I think about this isn’t interesting. What you think about it is," he said. "No matter if you are strong pro, strong con you are secure in sharing these views. I think being in the room with people who have different viewpoints and having a discussion is a dying art these days. There’s not enough of that going on. I’m proud to say in 41 rooms I haven’t had to demand civility. It’s been offered." Ten states and the District of Columbia have legalized recreational marijuana, which is still considered a schedule 1 controlled substance at the federal level. About 100 people were in attendance on Tuesday, and at the end of the night Fetterman asked for a show of hands in support, against and undecided on legalization. Four people indicated they were against and one person was undecided. Throughout the evening, community members and Penn State students took turns speaking, offering a variety of perspectives but with most coming down in favor of legalization. John Skerchock, a retired Pennsylvania State Police corporal, said his law enforcement experience informed his pro-legalization view. He said that in his career he arrested more than 400 people for driving under the influence and responded to more than 1,000 domestic disturbances, and none involved marijuana. "I think marijuana should be legalized so that my brothers and sisters can go after the serious people that have committed crimes bringing drugs into this commonwealth," Skerchock said. Many who spoke cited the costs of criminal prosecution and mass incarceration for marijuana possession, some noting the disproportionate effect on people of color. Several explained how those costs are both financial — for the defendant and taxpayers funding the criminal justice system — and personal, with drug convictions for marijuana hindering a person's ability to get a job, student aid and government benefits. State College criminal defense attorney Matt McClenahen said that he believes legalization is "inevitable" and that those who have been charged with marijuana possession are "victims of an unjust law." While details of legalization are worked out, he said that Pennsylvania should make possession of a small amount of marijuana and related paraphernalia charges summary offenses that are handled in district courts with community service, court costs and expungement. "It will be a lot cheaper, a lot quicker," he said. "The system we have now is a lot more draconian. I think this is the immediate solution but of course the only viable longterm solution is complete legalization and regulation similar to alcohol." Like several other communities in the commonwealth, State College has made possession of a small amount of marijuana a summary offense. But that does not extend to the rest of Centre County, including the Penn State campus. 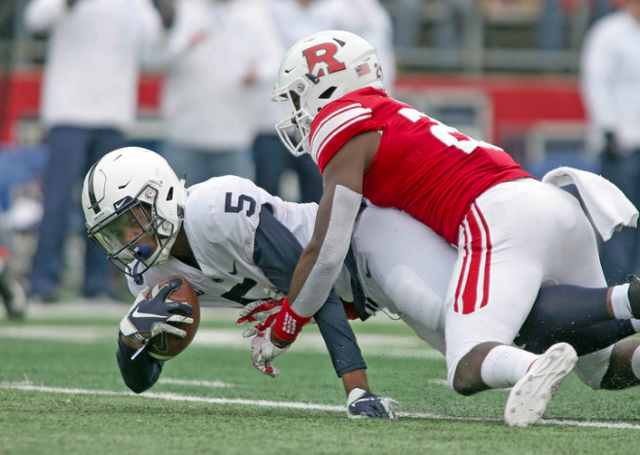 Kevin Horne, an attorney with Penn State's student legal services, said he has seen the significant financial impact that can have on students for matters as small as having a joint in their dorm rooms. Stressing that he was only speaking for himself and not the university or his office, Horne said the Centre County will frequently offer an Accelerated Rehabilitative Disposition program to first-time offenders, and while that helps individuals avoid having a criminal record, the costs are high. Horne said the program costs $1,300 and expungement is another $200. Penn State students who are charged are also required to take a $250 marijuana education course. For some students, that $1,750 can mean a choice between buying food, paying a tuition bill or paying court costs. "So many students… have come to my office and have had to make those types of decisions just because they were caught with a plant in their room," he said. Danelle Weller, a registered nurse who said she has "worked in every corner of the hospital," said she favors recreational legalization because she has seen first hand the positive effect that medical marijuana has had on patients, including those with cancer. "We have seen patients have significant help and relief of symptoms as a result of using it," she said. "It has shown me so many positive things and fewer negatives." While she said she wants there to be more research on marijuana, Weller also noted her experiences working in the emergency room and the large number of alcohol-related cases she has seen. "I have seen more tragic accidents and problems as a result of alcohol use in this area," she said. "I can honestly say I’ve never seen one tragic incident as a result of marijuana use." Pennsylvania legalized medical marijuana in 2016, but several speakers noted the hurdles that still exist for patients. Those include financial costs — patients must purchase a card from the state then pay high prices for medical marijuana, which is not covered by insurance. Nia Rodriguez, who manages Nature's Medicines medical marijuana dispensary in Patton Township, said many of the patients who are prescribed marijuana and come to her dispensary are over 60 and on a fixed income. Legalizing all marijuana would make it more accessible to those who are prescribed it for medical purposes. Fetterman said that lowering the price of and increasing access to medical marijuana is "one of most common things we hear on the tour." Angel Rodriguez, general manager of Nature's Medicines, said recreational marijuana would have a positive economic impact, providing jobs and tax revenue. "I know if I had my own grow facility here in Centre County, I alone could employ 350 people," he said. "That would take a lot of people off government assistance. The economics of recreational alone will be enormous... We want to legalize recreational marijuana to be able to help our community. We want to be able to change our community. We want to be able to do something for us." Others noted that medical marijuana is now being used to treat individuals who are addicted to opioids, which have often been legally prescribed. "If we had legalized marijuana 30, 40 years ago, we probably wouldn’t have the opioid crisis we have today," one resident said. "Now, medical marijuana is being used to help people get off of opioids." Two people who spoke had less positive views of marijuana, but did not say they were against legalization. Steve Woodward, of Madisonburg, said he was "agnostic" about the issue. "I lost an entire decade as a result of use and abuse of marijuana," he said. "It made my life unmanageable." Another person said he would not advocate using marijuana because he has seen the negative effects it has had on others, but that he would generally be in favor of legalization. As he has at other stops, Fetterman invited county commissioners and state representatives and senators to attend. He was joined on Tuesday by state Rep. Scott Conklin, D-Rush Township, and Democratic Centre County Commissioners Michael Pipe and Mark Higgins. "I can tell you he is a different type of lieutenant governor," Conklin said. "He’s hardworking, he cares and he’s not someone to stay in the background. I’ve never seen anyone… in his position go from county to county on any topic." Pipe said that he has remained neutral on the issue and would not use marijuana himself. But in recent years, the opioid epidemic and marijuana's potential for reducing overdoses has "pushed [him] into the pro-marijuana camp." He added that if and when marijuana is legalized, resources need to be available to help those who abuse it. "I like the fact that people spoke personally about this," he said. "I think any time you talk about an issue or change legislation in a huge way, starting from a personal place about how this can change lives is super important. It’s touching to hear from folks who had mental health issues, addiction issues and medical marijuana has been a positive force in their lives." After the listening tour is completed, Fetterman said a report will be submitted to Gov. Tom Wolf and the public and an interactive website will allow anyone to see data from each county. Legalization would face an uphill climb in Pennsylvania, where the General Assembly is Republican controlled and state GOP leaders have stated opposition to recreational marijuana. Wolf had previously said he did not think the state was ready for legalization but in December said it was time to start looking into it. State Senate Majority Leader Jake Corman, R-Benner Township, said at the time that Wolf's new position was "reckless and irresponsible." "I have a lot of respect for Jake Corman," Fetterman said on Tuesday. "He is a father, he has concerns and it’s really about having a conversation. He and I have spoken about this. There’s going to be things we agree on, things we don’t agree on, but the bottom line is that it’s important to have a conversation. I’m here to build bipartisanship not just in this issue but every issue, because that’s what gets things done in Pennsylvania. That’s how you can more forward in Pennsylvania." Fetterman said that as he's traveled to different counties, he's found differing opinions but that "virtually everybody supports decriminalization. They don’t want to see people’s lives messed up over minor, nonviolent convictions." In addition to providing comments at the listening tour stops, either by voice or on comment cards, residents can also register their opinions online. More than 30,000 people have submitted online feedback so far. On the tour, Fetterman said he has found "people really care about this," and have taken the issue seriously. "I enjoy the perspectives of people," he said. "One of the things of this tour is we don’t get the ‘Cheech and Chong’ and we don’t get the ‘Reefer Madness,’ like the sky is falling. We just get really thoughtful, informed opinions." Jahan Dotson just wanted to be ready. That was all he could control, everything else was up to chance and opportunity. If his number was called, he just had to be prepared for that moment. If he was prepared, the rest would take care of itself.